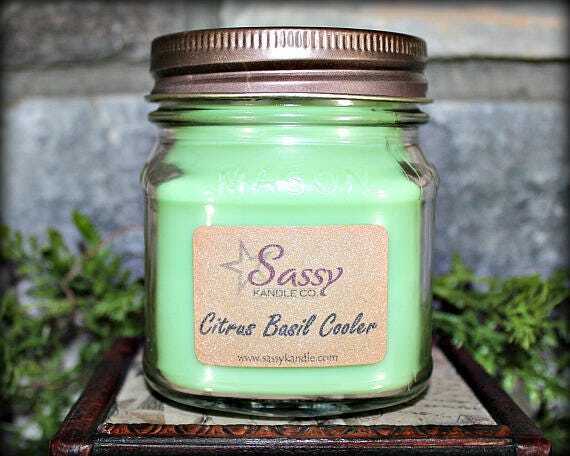 CITRUS BASIL COOLER | Mason Jar Candle | Phthalate Free | Sassy Kandle Co.
Fragrance: CITRUS BASIL COOLER - A zesty and clean fragrance infused with cool lemon, tart lime and fresh basil leaves. Refreshing and energizing! 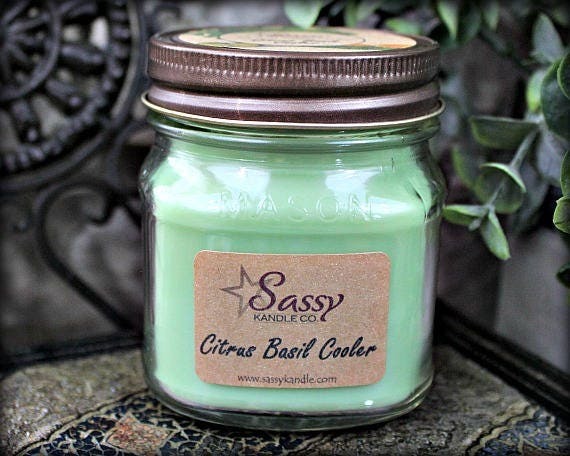 Sassy Kandles are made using a proprietary blend of soy & paraffin wax. Why use a blend of both waxes? We want to incorporate the best qualities of both types of wax (longer burn time, brighter/vibrant colors, and increased scent throw). 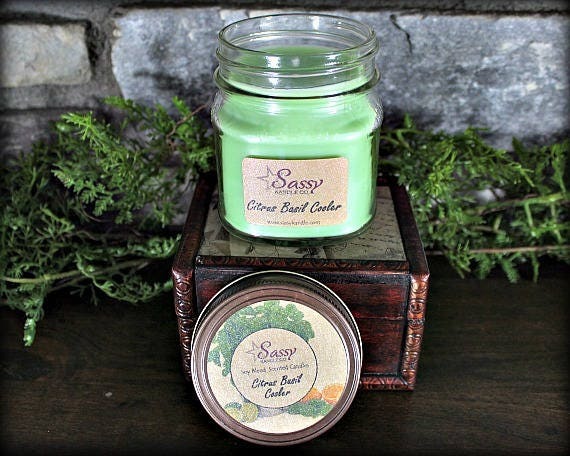 All of our candles are hand-poured in individual batches, ensuring a quality product every time – no mass produced products here! We use only premium fragrance oils that smell true to life – no fake chemical smell with our products. 8 oz glass mason jar burn approximately 40-50 hours. 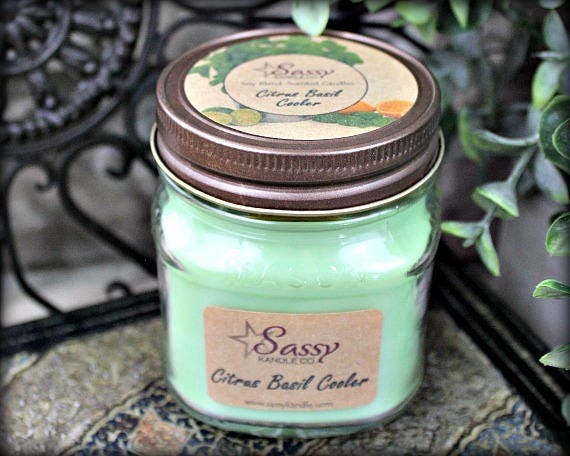 The glass jar is recyclable or may be repurposed for small storage and use around the house. 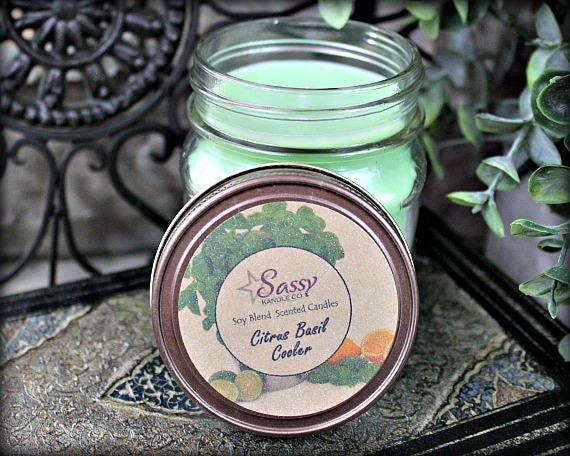 Candles are typically shipped via USPS with 3-5 days after payment has been received. If you need these candles sooner, please contact us and we will try our best to meet your deadline. Insurance is NOT included in the price listed below. If you would like insurance, please contact us. Actual wax color may vary slightly from these pictures. Products are typically shipped via USPS with 3-5 days after payment has been received. If you need your order sooner, please contact us and we will try our best to meet your deadline. REFUNDS / EXCHANGES: We want you to be happy with your purchase. If for whatever reason, you are not satisfied, please contact us right away. We will gladly refund or exchange your purchase within 2 weeks of receipt of your products less the original shipping costs. If doing an exchange or return, the buyer is responsible for returning items in the original condition as well as return shipping costs. If product was damaged during shipping, we will need pictures of the damage to submit a claim to the shipping company. Burn candles for 1-1.5 hrs for each inch in diameter. This is especially important for the first burn (this is to prevent tunneling). Allow the melt pool to reach the edge of the container. Do not burn candles longer than 4-5 hours as they can get too hot and become a hazard. Before lighting your candle, make sure the wick is trimmed to about 1/4 inch long. Keep debris out of you melt pool. If the flame is flickering, wither the wick is too long or your candle is in a draft. Large flames will burn/consume your candle more quickly than a smaller, steadier flame. Please discontinue burning candles when less than 1/2" wax remains in the glass/tin. Continuing to burn a candle when the wax is that low can be potentially hazardous.